Established since the founding of the university, the Faculty of Pharmacy prides itself on being one of the leaders in pharmacy education in Malaysia. The Faculty is the first private institution in Malaysia that offers the Masters in Clinical Pharmacy programme (MClinPharm) and the only higher education provider in Malaysia that offers the postgraduate Doctor of Pharmacy (PharmD) programme. The Faculty started its first intake of students for the Bachelor of Pharmacy (BPHarm)(Hons.) programme following the assessment visit by the Pharmacy Board of Malaysia (PBM) and Lembaga Akreditasi Negara (LAN) on 6th December 2005. The 1st level of monitoring of the pharmacy program was implemented on 30th-31st January 2007 and the 2nd level of monitoring was performed on 17th-18th April 2008, both by the PBM. The programme was granted a Provisional Accreditation status on 13th July 2009. CUCMS BPharm programme has successfully obtained its Full Accreditation status in 2010. Academic staffs at the faculty are passionate individuals who are active contributors to student development, faculty & University development, and researches in their areas of expertise. The Faculty has strong linkages and research collaborations with other Universities of international repute and leading Malaysian pharmaceuticals. The Faculty consist of 4 departments namely the Department of Pharmaceutical Sciences, Department of Pharmaceutical Technology & Industry, Department of Community & Pharmacy Practice and Department of Hospital & Clinical Pharmacy and 3 main units including Publication, Entrepreneurship, Research, Industrial Networking and Development Unit (P.E.R.I.N.D.U), Quality Assurance (QA) unit and recently established Halal Science Centre (HSC). 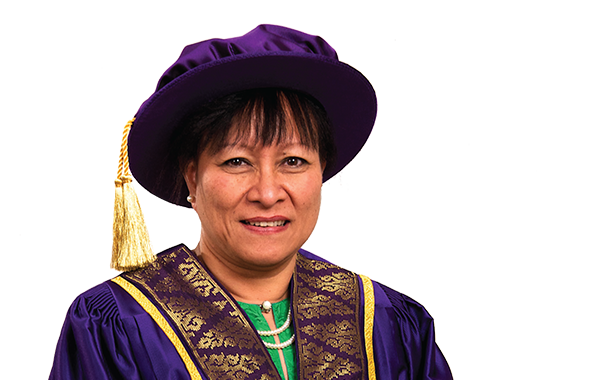 Prof. Datin Dr. Rosnani is Professor of Clinical Pharmacy and currently the Dean of the Faculty of Pharmacy. She obtained her Bachelor of Pharmacy (Hons) at Universiti Sains Malaysia, Master in Clinical Pharmacy at University of Strathclyde, UK under the British Council Government Technical Cooperation Training Award and her PhD at Universiti Kebangsaan Malaysia. She served the Ministry of Health Malaysia for 17 years before joining academia and her working experience contributed significantly to her teaching, a good balance between theory and practical. She has experience in all areas of pharmacy; academia, practice, research and administration. She pioneered the establishment and development of clinical pharmacy programmes at the undergraduate and post graduate levels i.e. Masters in Clinical Pharmacy (MClinPharm) at UKM and Doctor of Pharmacy (PharmD) at CUCMS. She is very actively involved in the development of clinical pharmacy education/practice in Malaysia. She had been a member of Drug Control Authority (DCA), Ministry of Health and a member of the Pharmacy Board of Malaysia and National Accreditation Committee for Pharmacy Education, panel members of MQA, External Examiners & Curriculum Review Committees of several pharmacy schools, and other special committees in the Pharmacy Division, Ministry of Health Malaysia. Her research interest is in clinical pharmacy education, development and evaluation models of pharmaceutical care and measurement of therapeutic outcomes.